Kaye’s marriage to Ronald Searle ended in 1967 and she died in 1995. Today, I keep my copy of “Looking at London and People Worth Meeting” on the shelf as an inspiration to me now I am writing pen portraits myself, and I sometimes think of Kaye here in these streets over half a century ago and imagine Ronnie – as she referred to him – bringing out his sketchbook in Sclater St where I buy my fruit and vegetables each Sunday. 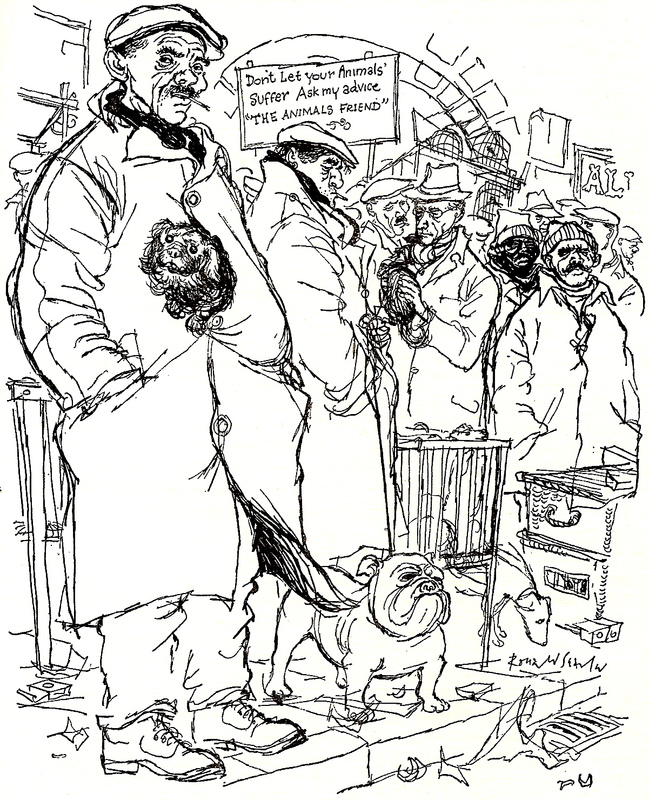 I am a great believer in serendipity and so I somehow knew that there would be a piece on Ronald Searle here today. The foreword to this book was written by Ronald Searle, who was also a POW under the Japanese, and to whom we will always be indebted for his wonderful drawings of those terrible years. i gave a book of his prison camp drawings to an art professor and devotee of goya’s war drawings for christmas (mmm, he has a dark sense of humor). as a connoisseur of fine art, he loved them. Ronarld Serle was a national treasure, sadly not much treasured in this nation as he was in his adoopted France or in America, where animation artists rated him highly (Disney’s ’101 Dalmations’ was highly influenced by his pen style.) As a kid I tried to draw pictures like the ones in ‘How To Be Topp’, even though the world of prep schools and latin lessons it depicted was a long way away from the kind of East End school I was attending. Later I discovered his p[isoner of war drawings and a wider wealth of work by the man who, perhaps unfortunately, will be mostly only known in the UK as the man who drew St Trinians. I love these drawings and the writing, who totally captures the essence of the place my dad used to bring me, looking for those mysterious spare parts. I renewed my daughter’s subscription to Puffin Post as a Christmas present to her. What a legacy. Well done, Gentle Author, for celebrating this genius. One of my earliest memories is at the age of 4 or 5 poring over my parents’ copies of his books of collected cartoons and the Nigel Molesworth books, and being intrigued by the violent St Trinians girls tying up and gagging their teachers or other little boys, setting booby traps and wielding fearsome weapons etc, probably not suitable viewing for a child of my age but these feisty females were arguably better role models than the simpering girls in my reading books who were always helping mummy in the kitchen while the boys helped daddy wash the car. Searle helped turn me into an early feminist, although that was probably not the original intention! I have always particularly loved his humorous cats, many of which were on display at Chris Beetles gallery this time last year in the exhibition “The British Art of Illustration”. Searle’s agent Chris Beetles did a huge retrospective exhibition of his work on his 90th birthday in 2010 which I went to, but I hope there will be another one now that he has gone as I am sure there will be renewed interest in his work. Slight correction. Searle’s agent was and is the Sayle Literary Agency, not Chris Beetles, though his gallery has mounted a number of exhibitions of Searle’s works over the years. Perhaps you missed the two exhibitions of Searle’s works at the Cartoon Museum in London in 2009 and 2010. Thank you so much for posting these drawings of Searle when life up the road from where I live, was even more intense. I’ve not seen any dogs there recently, only bikes and such. I’m glad you mentioned Kaye Webb too…Valerie Grove’s biography talks a lot about Searle. I think her incredible work for us little Puffineers must have helped fill the gap after his departure for a new life in France. Here’s Searle at 90 wondering how he managed so many kilometers of line…and talking about how champagne bubbles help. A fuel for a long life with an incredible breadth of talent from reportage, to illustration as well as cartooning. And I won’t mention those schoolgirls that the press labels him with. He only drew those for 6 years: “If it’s successful, kill it!” he says. ……. you dear gentle author are definately carrying on in the field of “warm hearted humanity” as cruikshank said of kaye webb and I bet she’d be so proud of you . Have a copy of this wonderful book along with other of Searle’s books on my shelf. He was such an inspiration to generations of illustrators and will be very sadly missed. I truly believe his illustrations were my first intro to dark humour, the pictures said a thousand words. There was always so much character alive in every marking. I too milled through Club Row as a very young child with my parents and always felt great discomfort when passing the cages and boxes due to my lifelong affinity with animals, but also, in sensing the human poverty, understood why it was there at all. Ronalds drawings bring it all back. Thanks again for sharing. 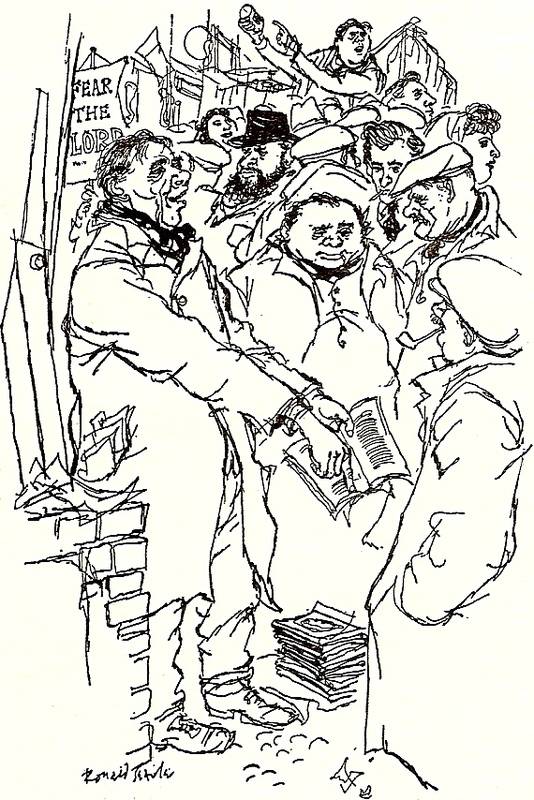 I am fortunate to have an original drawing from this book-it depicts my grandfather, Frederick North, in his antique shop on Crawford Street. (“A Happy Man”) It was a dark and mysterious place to a young lad and the drawing room upstairs, with rows of real voodoo masks was terrifying! I have learned more about my grandfather from this wonderful book than I ever knew when he was alive.